The ultra-compact Coda Audio LA5 brings the quality and versatility of line array sound to smaller venues and events than is possible with most systems. But its exceptional power and clarity also make it suitable for large shows. It’s this versatility that persuaded Dutch rental company FF Entertainment-Proaudiotechniek to invest in the system. Based in the town of 's-Hertogenbosch, north of Eindhoven, company proprietor ‘Funky’ Fred van Turenhout had become increasingly dissatisfied with the audio system he was using. He recently investigated a range of systems from various manufacturers and, via Coda Audio distributor Apex Belgium, found what he was looking for in the Coda LA5. The LA5A features four 5" neodymium ultra low distortion cone speakers and two 4" neodymium planar wave drivers. Power comes from integral high efficiency class D amplifiers for the low frequencies and Mosfet amps for the high frequencies, with control electronics that include optical limiters for each channel, 24dB phase-aligned asymmetrical crossovers, all pass filters and EQs to provide a perfect match between amplifiers and loudspeakers. 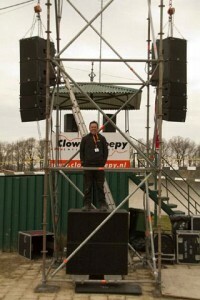 Up to 20 units can be arrayed to deliver optimal sound for larger venues. The complementary LA5A-SUB is a compact self-powered high output subwoofer, incorporating a 1000W high efficiency class D amplifier and a 15" neodymium ultra low distortion woofer. Extending the LA5 system response down to 38Hz, the LA5A-SUB’s excellent transient response produces fast high impact bass that is able to reproduce detailed and accurate low frequency information. Fred has invested in six LA5A cabinets and four LA5A-SUBs, including the flying hardware. Already he has used it on three very different events, all with great success. “The first event was the party after a show jumping grand prix in an equestrian centre, the second was a live performance at a party of up to 300 people and the third at an outdoor BMX cycling grand-prix event. They all produced different challenges, but every time the LA5 system delivered superb sound… and a big smile to my face!” he says. In the immediate future Fred will be using the system on another BMX event and at the celebrations of the coronation of the Netherlands new king, Willem Alexander, on 30th April. Dutch royal coronations traditionally involve a huge, nationwide party and Fred is looking forward to letting his LA5 system’s biggest audience yet enjoy its quality for themselves, as it relays performances by a variety of live artists.